When jobs and businesses and even lives depend on precision, rely on U.S. Nameplate. Our custom metal nameplates and safety labels are used in a wide variety of industries, including construction, medicine, electronics, the military, and mining. Our nameplates are designed to contain crucial and easy-to-read information for your industry. They’re formed and sized to adhere perfectly to your equipment. Our durable, high-quality, and custom nameplates provide instructions, offer warnings, and include critical information. From start to finish, in all we do, U.S. Nameplate provides in-house design, manufacturing, and service. For 70 years, we have been the supplier of choice to more than 3,000 Original Equipment Manufacturers (OEM) throughout the world. At U.S. Nameplate Company, we offer five different types of metals: aluminum, anodized aluminum, Metalphoto®, stainless steel, and brass. Depending on your working conditions—whether your plate will be exposed to extreme weather fluctuations, chemicals, humidity, direct sunlight, and/or the interior of a mine shaft, for example—we’ll make sure your metal nameplate is the ideal fit. Our rugged metal nameplates are designed to last up to 25 years in all weather conditions. Click here to learn about the unique properties of each type of metal. You can further customize your nameplate by adding beautiful and durable finishes, including satin, clear, red, matte, foil, brushed finishes, and gold. Whether these colors represent your business or brand or they simply help your nameplate and label stand out, you’re spoiled for choice at U.S. Nameplate. No job is too small or too large for U.S. Nameplate. From quick orders to enormous runs, we will custom design and produce a rating plate tailored to your project and your industry. And because everything we do is completed under one roof, our friendly staff can immediately respond to all your needs. Many industries require specific safety information including limitations for weight, temperature, lifting, or electrical hookups. We can design your data rating based on your specifications or can leave your plate empty for later written instructions. We’re proud to be an ISO certified facility and UL-approved label supplier. As an OEM, your job is to provide critical information. If you have a need, we can fulfill it. Our designers will work with you every step of the way. 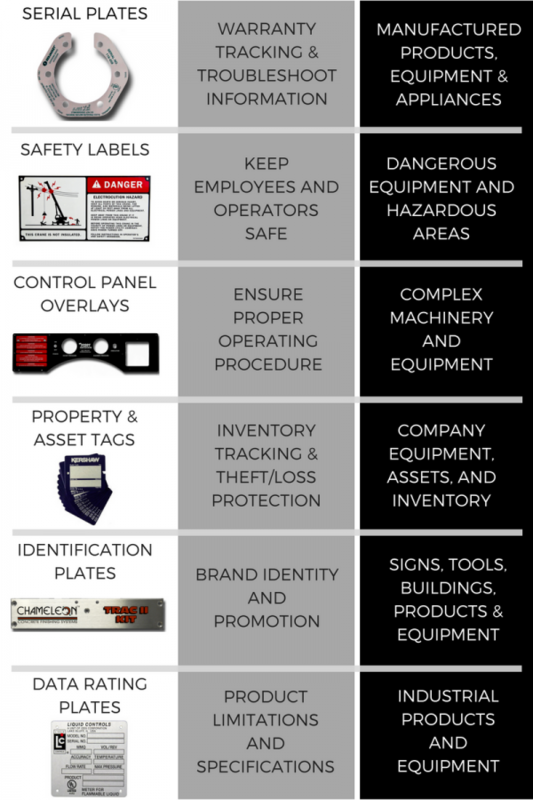 In addition to metal nameplates, we also offer decals, safety labels, signs, control panels, serial plates, and much more. Count on the professionals at U.S. Nameplate for all your identification products. Contact us today for a quote. We look forward to designing solutions for your needs. Anodized Aluminum Products from U.S. Nameplate Co.
Anodizing is an electrochemical process that coat metals, especially magnesium and aluminum, with a durable, decorative, corrosion-resistant, sapphire hard film. Unlike painting or plating, aluminum oxide is not applied at the surface, but is fully integrated with the aluminum, so it cannot chip or peel. To accomplish this process, aluminum is immersed in an acid electrolyte bath. An electric current passes through combining the aluminum atoms with oxygen ions that are released from the electrolyte bath. The benefits of anodized aluminum are plentiful. Durability, ease of maintenance, aesthetics, cost, and environmentally safe are all characteristics that make anodized aluminum one of the most widely used materials today in the production of consumer, commercial, and industrial products. The shelf life of anodized aluminum is almost indefinite and with a simple mild soap and water cleanse of surface dirt it could last forever. Anodizing allows aluminum to maintain its metallic appearance; scars, scratches and just general wear and tear are virtually non-existent. Anodized aluminum has a low initial finishing cost, and combined with low maintenance costs, is a good ROI for your business. Anodized aluminum is considered environmentally safe as it is fully integrated into the aluminum resulting in a non-toxic, heat resistant, producing few if any dangerous by-products. Here at U.S. Nameplate Co., anodized aluminum is used in many industrial metal products. Our customers in the automotive, racing, electronic, and transportation industries will tell you our control panel overlays fabricated out of anodized aluminum are built to withstand the harshest conditions. Whether you have a small or large order, we have the capability to produce property and asset tags with a number of materials including anodized aluminum, stainless steel, and brass. Whatever your material, finish, and design, we are sure to fit your specifications. Anodized aluminum is a great material for data rating plates as they are put through some of the toughest conditions in the construction, mining and general industries that require their metal products to stand the test of time. U.S. Nameplate is truly full service, every step of the manufacturing process is done under one roof. Since 1946, U.S. Nameplate Co. has been the supplier of choice to over 3,000 OEM’s and is equipped to handle any size of orders from one to millions. Request a quote or call us today. Underwriter’s Laboratory (UL) provides certification, testing, and training services to companies who make labels, panels, and decals for regulated industries. The standards set in place by UL, allow businesses to create quality safety labels for their products that comply with industry standards. Products marked by UL are thoroughly tested for safety, energy efficiency, and environmental concerns. Products that require safety-related information including hazards and warnings, installation instructions, electric ratings, and other information must comply with UL’s Component Certification Program. The program allows label manufacturers such as U.S. Nameplate Company to make labels with materials that meet UL standards and print labels that meet standards as well. Labels must also be waterproof. Products that are UL Certified wear the official UL mark. The UL inform customers that the product they are using is UL certified or safe, energy efficient, and environmentally sound. For more than 40 years, UL standards have helped today’s manufacturers, including U.S. 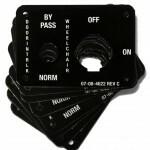 Nameplate Company, provide safe and compliant labels. U.S Nameplate is an authorized supplier of UL standard labels. UL certification allows manufacturers such as U.S. Nameplate Company to legally produce UL Labels; these labels adhere to very specific guidelines set in place by UL. To be considered certified, U.S. Nameplate Company adheres to the standards set in place by UL and produces quality labels for important products. Custom industrial labels and nameplates created at U.S. Nameplate Company meet and exceed standards set in place by UL and meet the conditions of acceptability laid out by UL that includes application surface, exposure condition and temperature rating. Labels from U.S. Nameplate Company are made to withstand indoor, outdoor, and harsh weather conditions. For more information about UL authorized custom industrial nameplates and labels from U.S. Nameplate Company, visit our website or give us a call at 1(800)553-8871.